Most kids would be ecstatic to learn that school is letting out early for summer break. Not 14-year-old Ida Bidson, heroine of Avi's The Secret School. When Mr. Jordan, the miserly school board president, makes the announcement - Ida's teacher will be moving to Iowa to care for her ill mother, so the one-room schoolhouse will be closed until next term, at the earliest - she is devastated. If school lets out early, she will not get credit for the work she has completed, thus delaying her entrance into the high school in town. Her dreams of becoming a teacher are further shattered when Mr. Jordan scoffs at her concerns, telling her, "I'm not so sure a girl needs a high school education" (11). She knows that attending high school was never a sure thing. After all, it's 1925 and things are hard, especially for the sheep farmers in rural Colorado. Still, Ida can't bear the thought of living out her life as a farmer. She has a dream, and she may have to risk everything to achieve it. When Ida's friend Tom makes a suggestion - "You're such a gravy know-it-all ... You could take over the school when Miss Fletcher leaves" (18) - her hopes revive. Nervously, she accepts the challenge, insisting that the children keep mum about their "secret school." Ida knows teaching won't be easy, but soon she's dealing with a myriad of crises - from an insubordinate student to his ignorant father to an irate school board. All of this is in addition to her usual chores on the farm and her own studies. Soon enough, Ida wonders if she's gotten in over her head. Her childhood seems to be slipping right through her hands. Finally, a school official agrees to give the students credit for the year only if all of them pass a final exam. Ida worries for her students, and herself. With all the responsibilities Ida has taken on, she's barely had time to crack open her own books. The fate of the school lies in her hands - will plucky Ida be able to save it? Or will her dreams crumble under the weight of her failure? The Secret School is a short, simple read aimed at young readers. Still, Avi manages to pack in some very complicated and adult themes. At the heart of the book are questions that must plague all teachers - how much of my own life am I willing to give up in the service of my students? Where do I draw the line between being a friend and an authority figure? And, how do I cut through all the red tape and prove to my community that a good education is worth making a few sacrifices? It also discusses issues at stake when a child is teetering on the edge of adulthood - how does a kid get the courage to defy parents and conventions in pursuit of a dream? And, is it disloyal to even attempt it? As you can see, I was impressed with the author's ability to raise so many interesting questions while telling an exciting, compelling story at the same time. 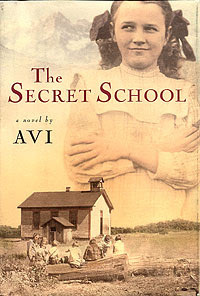 Because of its many layers, I think The Secret School is a book both children and adults will enjoy. Kids will like it for the adventure (the schoolchildren drive Model T's, build a radio, and most exciting, keep secrets), while adult readers will appreciate it for the engaging characters, swift plot and important themes. It's a very quick read with universal appeal. The Secret School gets top marks in my grade book. I hadn't run across this one before and it sounds really compelling. I'll have to look for it. You wrote a really nice review! This one sounds good. I think I've read one book by Avi--Crispin, if I'm remembering right. I just know I liked it!